What is da Vinci 10? da Vinci 10 is an anti-ageing serum containing 5 growth factors specifically engineered in Korea for anti-ageing and skin rejuvenation. It contains 10,000 ng/ml of 5 different growth factors. These growth factors are individually designed to firm, contour, & brighten the look of skin. This powerful anti-ageing formula helps stimulate natural cell activity to help restore the appearance of skin’s elasticity, resilience, tone, and texture. da Vinci 10 is formulated for daily use. Growth Factors are proteins that are naturally occurring in the body and are found in our own blood’s platelets. They were discovered in 1986 by Professor Cohen and Rita Levi-Montalcini who both won a Nobel Prize for their discovery. Our body needs growth factors, as they imply a positive effect on cell division and hence, cell multiplication. Over the last two decades, growth factors have been increasingly used to treat hematologic and oncologic diseases as well as wound care management. Today, growth factors are being used extensively in cosmetic surgery, with particular reference to PRP or Platelet Rich Plasma procedures. 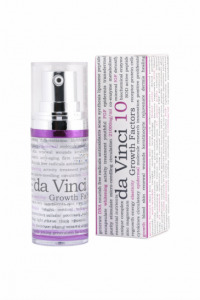 da Vinci 10 is not of human origin and has been formulated in a university hospital using protein technology to make a powerful anti-aging serum. da Vinci 10 can be used in your own home and works best in combination with an 8-10 week in-clinic program using da Vinci 21.
da Vinci 21 contains 21,000ng/ml of growth factors and provides a “fast-track” solution to younger looking skin.